No Settling - Vistual Confirmation. Superior Fire Resistance and "R" Value of Cellulose Fiber Insulation. "R" Value Without Density and Air Leakage Sealing is Meaningless. WARNING - DO NOT ATTEMPT TO DUPLICATE THIS DEMONSTRATION WITH ANY OTHER TYPE OF INSULATION. Project aims to prove effectiveness of dry cellulose. Brian Riessen is an Iowa-based insulation specialist who installs up to 100 jobs per year. For the last decade, all of those projects were insulated with dry cellulose. "I guess what first attracted me to it is that it's a recycled product," he recalls. "I had been with a weatherization program and saw what a great value it added to old homes, so doing it to new construction was a natural for me," he recalled. "Now ParPAC is what we use in everything we do." Among Riessen's current projects is a passive solar demonstration home now under construction in Christmas Cove, Maine. The south facing structure has been engineered for an air infiltration ratio of less than .9 air changes per hour. The building's shell will be insulated with ParPAC (90 percent recycled content) with a goal of reducing the energy used in heating and air conditioning by 50 percent. 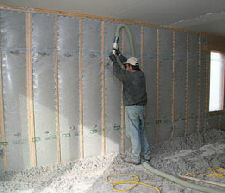 Brian Riessen (photo, right) blows ParPAC cellulose insulation behind a polyester vapor barrier. After the spilled material is vacuumed up for reuse, the wall is immediately ready for sheet rock. $20,000,000,000.00 in Federal Money under (HR3021) to create jobs. Get 15 historical and analytical documents showing studies about the Performance Failures and dangers of fiber glass insulation with the DVD..
BUY THE INSULATION FRAUD GLOBAL WARMING AND THE 4 DEADLY SINS VIDEO AND RECEIVE A... FREE... COPY OF THE PAR/PAC 17 MINUTE TRAINING VIDEO ..PLUS THE GREAT MARKETING LITERATURE PACKAGE THAT WILL PROVIDE YOU WITH THE SALES AND MARKETING TOOLS YOU NEED TO GET UP AND RUNNING. NOT ONLY DO THESE TWO VIDEOS SHOW YOU HOW THE CROOKS "CHEAT" PEOPLE (THERE IS A $10,000.00 FTC FINE IF APPLICATORS GET CAUGHT) BUT THESE TWO VIDEOS SHOW YOU THE RIGHT WAY FOR INSTALLING DRY BLOWIN CELLULOSE INSULATION WITH OUR 3 PLY REINFORCED VAPOR BARRIER, RETAINING WALL MEMBRANE. THE DEMAND FOR CELLULOSE INSULATION IS SKYROCKETING DUE TO THE WORLD FINDING OUT THAT FIBER GLASS INSULATION IS A KILLER AND A FRAUD AS AN INSULATION. IT IS NOTHING MORE THAN MAN-MADE ASBESTOS. TAKE THE ENERGY AUDITOR 3 DAY COURSE OFFERED BY YOUR STATES DEPARTMENT OF ENERGY. THE OBAMA ADMINISTRATION IS PUMPING BILLIONS INTO RETRO-FITTING AMERICA'S AGING HOUSING INVENTORY. BUILDERS OF NEW HOMES ARE BUILDING ENERGY STAR AND "GREEN" ENERGY EFFICIENT HOMES. THE REAL WORLD (AS BUILDERS ARE DISCOVERING) IS THAT YOU CAN NOT CONSTRUCT HOMES AND STUFF FIBER GLASS IN THEM AND EXPECT THEM TO PASS BLOWER DOOR AIR INFILTRATION TESTING. SEE PAR/PAC'S DISTRIBUTOR LIST. CALL FOR A DELIVERED PRICE ON A GREAT ACCUONE MODEL 9400 INSTALLATION MACHNE. VISIT THEIR WEB SITE @WWW.ACCUONE.COM, (Tell them that you are working with Richard Munson of par/PAC™). TELL THEM YOUR WORKING WITH RICHARD MUNSON TO HELP YOU GET....BACK TO WORK. HELPING YOURSELF...HELPING AMERICA FREE IT SELF FROM FOREIGN OIL AND HELPING TO REDUCE CO2 EMISSIONS FROM HOMES. HOMES ARE THE NUMBER ONE CONTRIBUTOR TO GLOBAL WARMING AND CLIMATE CHANGE. THANKS TO BUILDERS PAST USE OF FIBER GLASS INSULATION (NOW DIEING A WELL DESERVED DEATH) THERE ARE MORE THAN 80 MILLION UNDER INSULATED HOMES IN AMERICA. YOU CAN GET TO WORK SOLVING THAT PROBLEM AND MAKE A GOOD HONEST LIVING DOING IT. LET US HELP YOU GET STARTED. Richard Munson, President PAR/PAC™ Inc.
No Reason To Be Out Of A Job - Start your own Cellulose Insulation Installation BUSINESS TODAY! 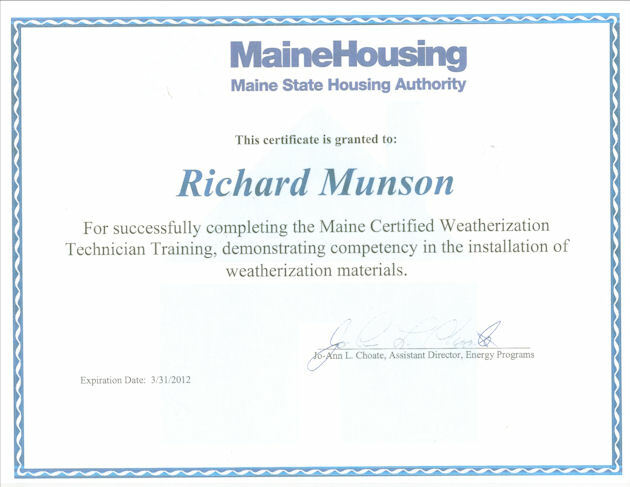 STEP-2 SIGN UP FOR YOUR STATE'S WEATHERIZATION TRAINING PROGRAM. CONTACT YOUR STATE'S DEPARTMENT OF ENERGY. GET INFORMATION. GET FREE ON THE JOB TRAINING IN MAINE, GEORGIA, IOWA AND UTAH. CALL GERARD GAGNON AT ACE INSULATION. More training Centers Opening. IOWA - CALL BRIAN RIESSEN (712) 269-1326 AT RIESSEN AND MIDWEST CONSTRUCTION. The AccuOne 9400 is a portable, all fiber blowing and spraying machine, engineered with the busy contractor in mind. The variable speed blower and adjustable material feed provide powerful, efficient operation with maximum production from a 115 volt machine. Durable construction and corrosion resistant coating provide long life with minimal maintenance. Our product is simply a systematic application of two major components, when working together, provide the greatly enhanced reduction in heating and air conditioning cost through reduced air exchange between the inside air and the outside ambient air temperature and humidity. The Cellulose is a fire retardant, densely packed and monolithically sealed with a polyethylene product to provide an optimized insulation seal. 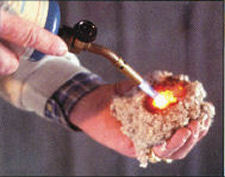 Fiberglass will melt when exposed to flame. The glass fibers are fragile composites of inorganic silica (melted sand) combined with other minerals. The "R" value of fiberglass is a result of air pockets trapped in between glass fibers. If you compress the thickness of a fiberglass batt you reduce its "R" value. Cellulose derives its "R" value from air cells trapped inside the organic fibers. Cellulose fibers used in cellulose insulation start out their life as a tree... Trees specifically grown to manufacture pulp for soft sheet newspapers that you handle daily. The paper resource is recycled and manufactured (fiberized) to become a fire resistant product by the addition of borate fire retardants. The same borate chemicals that are used to suppress forest fires all over the world. Borate in one form or another is used in over 200 consumer products. It is a permanent fire retardant and complies with ASTM & Federal specifications.When cellulose insulation is dense packed pneumatically to a 3# P.C.F. density it develops significant burn resistance due to the absence of convective air/oxygen needed to support combustion. See "document" link above. par/PAC reinforced polyethylene is a 3 layer composite consisting of two outer layers of recycled polyethylene separated by a middle layer of recycled polypropylene string fiber.The par/PAC poly product is an effective vapor barrier if the openings/slits and penetrations made in it for pneumatic installation (blown in) are sealed. If left unsealed it is no longer a vapor barrier but rather it is simply a very strong membrane/retaining wall for dry blown in cellulose fiber insulation. The par/PAC poly must be "lip" stitched (stapled tightly" to avoid pillowing. Follow the instructions to assure that it is "Drum Skin Tight".